The Importance of Asian Americans? It’s Not What You think. In our previous report, Left or Right of the Color Line, we explored what we heard from nationwide interviews with racial justice leaders, organizers, scholars, and artists about Asian Americans and the racial justice movement. The vast majority of the 57 interviewees who ended up in our analysis were Asian Americans, except for three African Americans whose work cuts across communities of color. 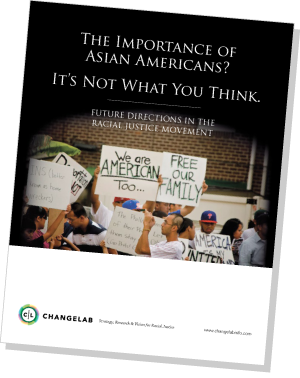 While Left or Right focused on Asian American racial identity and behavior, this report looks at the challenges that Asian American racial justice activists face, and strategies for moving forward. As we reported previously, several informants said that many Asian Americans embraced “honorary whiteness” and, therefore, any kind of Asian American organizing must be anti-racist. If that’s true, then what does it look like to assert Asian American-ness authentically, expansively, and progressively? It should come as no surprise that this work is already happening. After all, no amount of model minority framing can erase the fact that “Asian American” began as a political identity. The historical basis for being Asian American is twofold — a rejection of labels like “Oriental”, “gook”, “Jap”, etc., and their roots in war and imperialism, and a fundamental commitment to interracial solidarity. In reality, there were no Asian Americans before the Civil Rights, Black Power and antiwar movements. And those of us who dedicate our lives to combating white supremacy today are authentically Asian American. This might seem like an academic argument given how many people, including Asian Americans, are unaware of this history. Idealizing those movements of the ‘60s and ‘70s dangerously masks the problems within them, and the important lessons to be learned. Still, there are both hope and affirmation to be found in the radical roots of Asian American identity for those of us committed to racial justice. That’s why being Asian American matters.